Question: What attracted you to the material and why did you want to explore this story? Sebastián Lelio: I immediately fell in love with the three main characters; it is a love story between all three of them and how their relationships evolve and their lives are affected by these days of grief. Question: As a Chilean director, how did you find working on the subject matter of Jewish Orthodox in North London? Sebastián Lelio: The Jewish Orthodox background is of course very important but what's really going on in the film, in a certain way transcends that particular cultural specificity. The heart of the story is very universal. Question: How would you describe your process of working with actors? Sebastián Lelio: I love actors and have a way of working with them where you're still able to see the person behind the character. So what you see on the screen is the person interpreting the character, you see an actor giving an artistic battle in front of your eyes and I do believe that is where the greatest amount of cinematic pleasure comes from. Question: How would you describe the relationship between Ronit, Esti and Dovid? Sebastián Lelio: Ronit is this modern, free spirited woman who has run away from her origins. Esti has stayed in the community but has run away from her true self. By letting Ronit know of her father's death, Esti not only allows Ronit the opportunity to reconnect with her origins, but also calls her own destiny; knowing this is her last chance to be set free. And there is this other important element of Dovid, the Rav's spiritual son and natural successor. The days of mourning allow all these passions and repressed feelings to come out and a new order is established. Question: And what did Rachel Weisz, Rachel McAdams and Alessandro Nivola bring to the trio of friends? 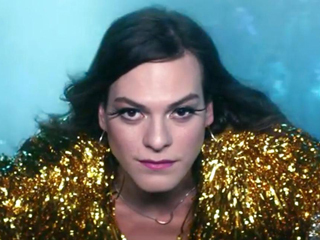 Sebastián Lelio: They are like a rock'n'roll band with three guitar players, and that brought the main source of energy to the film; they're defending their characters and that creates great cinematic tension. 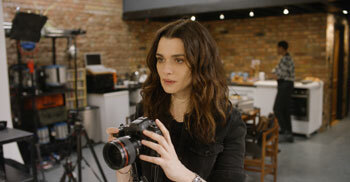 Question: What was it like to work with Rachel Weisz as a producer, as well as an actor? Sebastián Lelio: One of the main reasons why I accepted the project was because Rachel Weisz was involved. I've always admired her and imagining her as Ronit with her rebellious soul was irresistible. We did write the script with her in mind to play Ronit, so all the things that I've always admired about her could have the opportunity to come out and shine, Ronit's personality created a lot of opportunities for complex emotions to emerge. Question: How did Rachel McAdams come to be involved and what did she bring to the character of Esti? Sebastián Lelio: Rachel McAdams had inner nobility and brought a lot of dignity to the character. During the years, Esti has become a master in disguise, hiding behind wigs and manners. But deep inside she's a desperate woman trying to reconnect with who she is. Even though Esti is navigating through a lot of complex situations, there is something very stable about her that allowed the character to be strong and fragile at the same time. Rachel McAdams was capable of dealing with all these complexities with incredible artistry and grace. Question: Can you elaborate on the relationship between Ronit and Esti and what Rachel Weisz and McAdams brought to it? Sebastián Lelio: I followed my intuition that the collision of Rachel Weisz and Rachel McAdams was going to be beautiful to see and generate great sparks. In a certain way, I saw Ronit and Esti as the same person divided in two. One escaped and became free, the other stayed and embraced the religion; but both paid a big price. Question: What do you hope the audiences will feel whist watching Disobedience? Sebastián Lelio: Disobedience is a very intense journey. The characters are going through a certain turmoil that defines the film and makes it oscillate between different tones. The story explores the whole emotional spectrum of Ronit, Esti and Dovid. They feel very real, very close. You feel like you are sitting at the dining tables and lying in those beds with the characters; Even though we might not know much about the very secretive world of London Jewish Orthodoxy, the film generates a very intimate, strangely familiar feeling. Question: Why do you think it's an important story to tell at this time? Sebastián Lelio: Disobedience is a story about confused human beings interacting and trying to do the best they can against a background of fixed conceptions. This is a story about characters that are willing to change and evolve, but to do so they have to go through very rigid structures and that confrontation resonates with what we're going through nowadays as a human society all over the world, where the old paradigms seem to be either obsolete or insufficient. I always felt that there was certain urgency in bringing Disobedience to life. Question: What attracted you to the script when you first read it? Alessandro Nivola: What attracted me to the script was the trio of friends that all mean well and yet somehow create a messy situation despite their affection for each other. It's a totally human situation that is unavoidable and painful. Question: What was your initial reaction to reading the script? Alessandro Nivola: I loved Sebastián's Gloria so I already knew how talented he was and became immediately curious to know more about his work. When I read the outline of the script, I thought Dovid would be a secondary character supporting the heart of the story, so I was surprised when he had more capacity and his story was integral to the overarching narrative. The script presented a problem that pits belief and religion against modernity and changing times and questions how to reconcile those two things. Dovid represented someone who had committed his life to his religion in a very intense and profound way, and has to reconcile those beliefs against his sense of goodness and his love for the people he is closest too. It really explored that dilemma for him in a detailed, complex and beautiful way. Question: Did you use Naomi Alderman's book to further enhance your understanding of the character? Alessandro Nivola: The descriptions of Dovid in the book and script varied quite a lot so my first instinct was to concentrate solely on the script as something that existed all on its own. But as I started to research the character, I felt this pull back to the book to get more details about the particular community. When I went back and started reading the book more closely, I realised that Dovid wasn't too different from how he had been rendered in the book and it became a really valuable resource for me. Question: How much research did you undertake for the role? 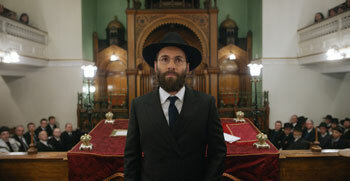 Alessandro Nivola: The first thing I discovered when I started the research was that within the Orthodox community, there are a million shades of grey in terms of how people observe their religion. So the first challenge was to work out where this particular community was on that spectrum. The research I undertook was the most interesting that I've ever had as an actor, both intellectually and on a personal level. I met so many people that took me into their community. The friends that I've made at Shabaz dinners are friends for life. I have felt a responsibility throughout the making of the film to get across the incredible warmth of the Orthodox community. These are people who are full of passion and affection for each other. Sometimes the Orthodox is perceived like a hostile community; ruthless in its judgement of the outside world, but that hasn't been my experience. Question: Can you elaborate on Dovid's close relationship to Ronit's father? Alessandro Nivola: At a young age, he saw a quality and a connection with god in Dovid which could help bind the community together in a way that he had, so he became his pupil. Dovid's adolescence would have been spent with this man, which is how he came to be so close to Ronit and her best friend Esti, who he might not have known otherwise because young men and women are kept quite separate in the Orthodox world. After Ronit left, he became adopted by him as his only child so the situation is difficult for everyone. The man was essentially his father. His death at the beginning of the script really sparks of this confusing situation where she comes back to mourn him and I'm there mourning him like a father. Question: Can you describe the relationship between Dovid and Esti? Alessandro Nivola: I love the way that Dovid and Esti's relationship is written because it's a good marriage and they have a deep respect for one another. What is wrong with their marriage is so subtle and yet essential; she is a lesbian. There is every reason why Dovid and Esti could have gone all those years thinking their marriage was worth preserving, yet in the end she has to be who she is and love the way she is naturally inclined to love. Question: What did Rachel McAdams bring to the role of Esti? Alessandro Nivola: The character that I've watched her create has been a person who is incredibly shy, quiet seemingly meek, but with this burning furnace inside her. Esti is someone who is full of passion, but not accustomed to expressing herself that way and Rachel instantly understood that fundamental part of her character. Question: What was it like to work with Rachel Weisz? Alessandro Nivola: Rachel and I have a long history together; my first film in the UK was co-starring with her in 1998. It was wonderful to work together again after all those years. Rachel has a rebellious soul, so I could see why she responded to the book and designed this role for herself. She's fearless and has a little bit of mischief in her eye. Question: What did you enjoy most about working with Sebastián? Alessandro Nivola: I've felt completely free even within the boundaries of what my character's behaviour would be. From the first moment we met and talked about the way that he wanted to work, it became clear that performance was really the most important element. Question: What do you hope audiences will take away from watching the film? Alessandro Nivola: Life is always presenting you with situations that aren't easily resolved. So ideally people will walk away without easy answers; the best stories are the ones that aren't packed. Hopefully people will walk away having had their opinions and preconceptions about certain life challenged.